NAITCH HOLDING HIS (PWI) 1984 "WRESTLER OF THE YEAR AWARD" TROPHY!!! OUT OF ALL THE PAGES ON THIS WEBSITE AND ALL THE INFO ON "THE NAITCH" THERE IS ONE AREA THAT'S NOT BEEN DISCUSSED IN ALL THESE YEARS AND THAT IS THE PWI (PRO WRESTLING ILLUSTRATED) "WRESTLER OF THE YEAR" AWARD, GIVEN YEARLY SINCE 1972 BY PROFESSIONAL WRESTLING MAGAZINE "PRO WRESTLING ILLUSTRATED".....THE MAGAZINE RECOGNIZES THE BEST PROFESSIONAL WRESTLER OF THE YEAR AS VOTED BY READERS OF THE MAGAZINE. 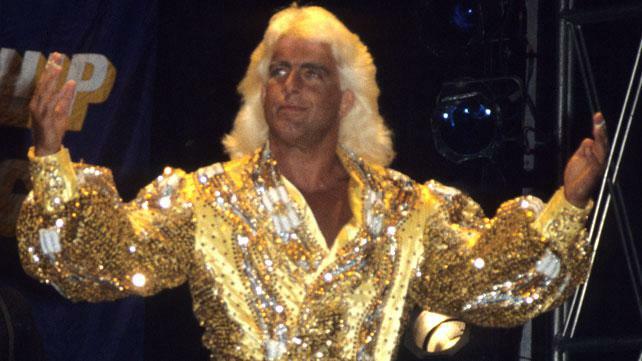 IF ALL THOSE ACCOMPLISHMENTS WEREN'T ENOUGH THERE IS ONE AWARD THAT STANDS OUT ABOVE ALL ELSE AND THAT IS THE COVETED "WRESTLER OF THE YEAR" AWARD........THIS IS THE MOST PRESTIGIOUS AWARD OF ALL THE "PWI" AWARDS AND IT'S ALSO WERE THE "NATURE BOY" STANDS ABOVE ALL THE COMPETITION BY A LANDSLIDE. 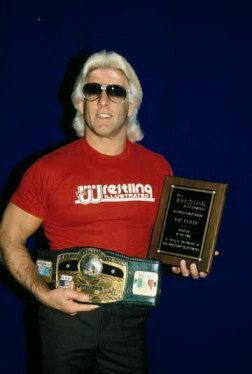 "NATURE BOY" RIC FLAIR HAS BEEN VOTED "WRESTLER OF THE YEAR" A RECORD 6 TIMES WHICH IS TWICE AS MUCH AS ANYBODY ELSE......THE MAN TOOK HOME THIS AWARD IN 1981, 1984, 1985, 1986, 1989 AND IN 1992, AND ON TOP OF ALL THAT HE WON THE (PWI) "WRESTLER OF THE DECADE" OF THE 1980'S. ALL THESE ACCOLADES PROVE ONE IMPORTANT THING AND THAT IS THAT RIC FLAIR IS NOT ONLY THE MOST AWARDED SUPERSTAR IN THE HISTORY OF THE SPORT HE IS ALSO THE SINGLE GREATEST PERFORMER, SUPERSTAR AND WRESTLER THAT GOD'S EVER CREATED AND THAT'S THE BOTTOM LINE CAUSE THE "PWI" SAYS SO. WOOOOOOOOOOOOOOOOOOOOOOOOOOOOOOOOOO!!!!!!! !